Directory of over 1,000 firms and chambers looking to recruit trainees and pupils, with specifics on their organisations and application requirements, as well as core editorial offering advice and information on application and interview technique, alternative careers, work experience and more. Contribution and comment from leading professional bodies, including the Law Society, Solicitors Regulation Authority, Bar Council, Bar Standards Board, Chartered Institute of Legal Executives, Junior Lawyers Division, Young Barristers’ Committee, LawWorks, the Free Representation Unit and more. Over 40 profiles of senior solicitors and barristers, offering insight into their path to the law, specialist areas of expertise and advice on how to succeed, and around 30 first-hand accounts of what it’s like to be a vacation scheme student at some of the most well-known firms in the United Kingdom. The LawCareers.Net Handbook is designed to be your companion and adviser throughout your journey to becoming a solicitor or barrister. Among other things, it will help you to learn more about: what lawyers do and the different types of law they practise; the different types of organisation involved in law; the path to becoming a lawyer; and about yourself, what you have to offer and how to sell your skills and personality to employers. 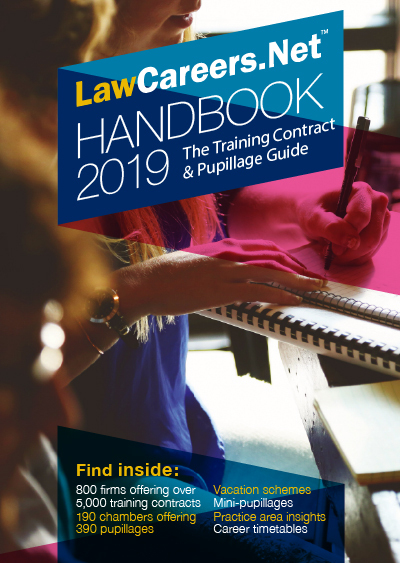 The LawCareers.Net Handbook 2019 is now available free through university careers centres and law faculties. Alternatively, you are able to purchase a copy using the online order form on this website.